Rio de Janeiro (AFP) - Rio de Janeiro launched an operation to wipe out dengue fever-carrying mosquitoes Wednesday, after an explosion of cases of the potentially deadly tropical disease hit the 2016 Olympics host city. Municipal workers deployed across the city to clean up mosquito breeding grounds and encourage residents to do the same. 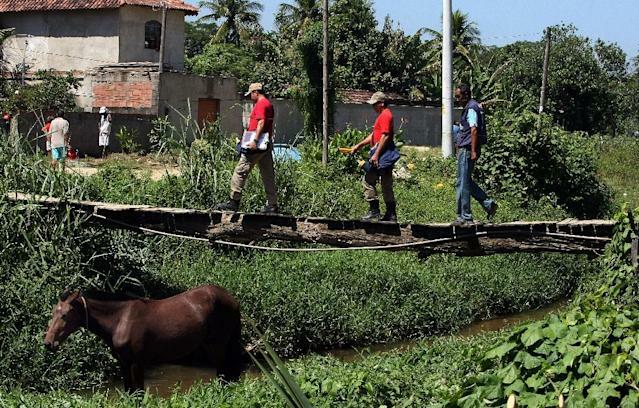 In the northern neighborhood of Tijuca, they broke through the gates of abandoned houses to clean up the standing water where mosquitoes lay their eggs. "There are homeless people who come around here and leave their litter behind. When it rains, that fills up with water and that's how an area gets infested," said sanitation worker Luciano Lobo. Rio de Janeiro state has registered more than 67,000 cases of dengue this year, an increase of 550 percent from last year. Authorities say the surge may be due to a record drought earlier in the year, which led residents to store water in whatever way they could -- and inadvertently gave the mosquitoes ample new breeding grounds. Dengue, which causes flu-like symptoms, can be deadly if it develops into a hemorrhagic fever. It has killed 23 people this year in Rio state, up from 11 in 2014. As part of the campaign, health officials are spreading the word to leave empty bottles and jars upside-down and clean up standing water in gutters, flower pots, old tires and the like. Brazil on Monday joined Mexico and the Philippines in authorizing a new dengue vaccine, the world's first. Across Brazil, dengue has infected more than 1.5 million people this year and killed 839.